…Living in the UK and the North-East in particular, means layering is more than just a styling technique, its a way of life. We have the most erratic weather here, this year more than ever. With the days beginning with rain and ending with sunshine, dressing has never been more of a challenge. With the freak weather in mind and a day off work, i decided to pair up two printed seperates i bought in the sales last year. 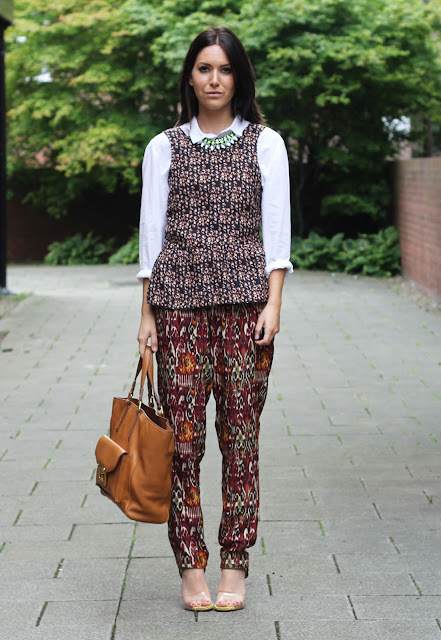 I layered the printed peplum over a white shirt and added a jewelled neon necklace around the collar. Trousers like this are perfect for a long day at work or shopping, they are so comfortable they feel like you never took off your pyjamas!